The long awaited music and rhythm arcade machine, Neon FM from Unit-e Technologies, is finally set to be released in to the world beginning with it's showcase and sale at the Amusement Expo 2014 in Vegas, March 26th! Neon FM is a music and rhythm game, with a bongo drum style control motion. 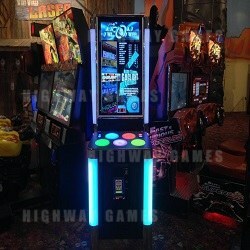 The cabinet features five circular pads, all lighted different colours, and players must tap the pad whose colour corresponds with the note on screen. It has been doing the rounds of location testing recently in the US, and can currently be found at Adventure Park USA, in Frederick, MD. This follows an very successful stint at MAGFest recently where it received an amazing reception from players. On their Youtube channel, the Neon FM team said, the game "racked up 1,710 plays in 72 non-stop hours at MAGFest 12! For those of your [sic] doing math, that's less than 30 seconds between songs, 24 hours a day!" The cabinet has an included card scanner and cross-platform, mobile compatibility features, and testing has allowed the team to fix any last minute bugs or issues, including: audio distortion, sync issues (tightened thei beat-matching algorithm), frame issues, as well as track updates. Neon FM will be released with a 50 song strong tracklist, and Unit-e will be providing regular online updates to keep the list current. Please note: All images courtesy of Neon FM facebook page.